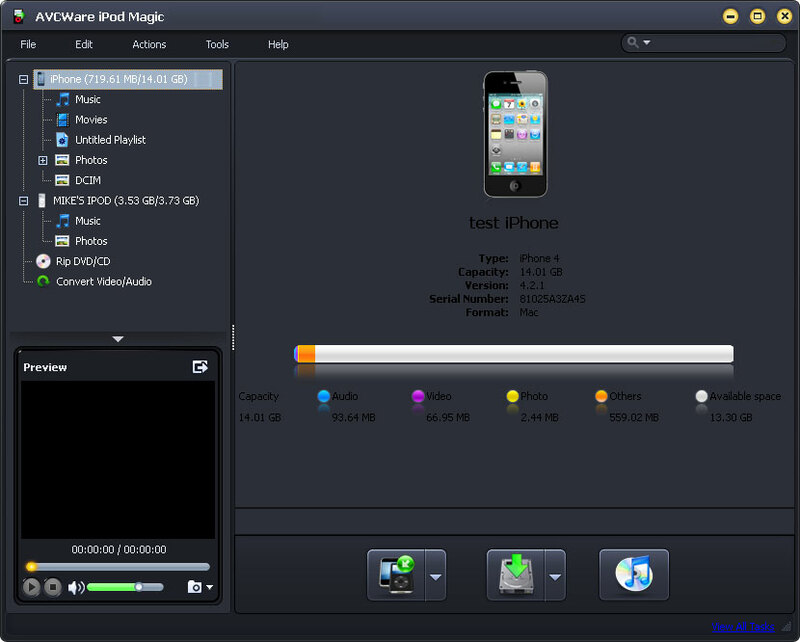 AVCWare iPod Magic is a 3-in-1 iPod transferring, converting, ripping and managing tool, which helps you copy music/movies/photos from iPod to PC and vice versa, backup iPod files to iTunes as well as convert non-iPod format files (DVD, audio, video and others) and transfer them straight to iPod. File transferring between iPhone and PC is also supported. Transfer iPod to PC, Rip iPod Files to iTunes. ...... Photos and videos shot by the device are also supported. 2. Connect multiple iOS devices up at the same time and transfer files among them just by drag-and-drop. 3. Also convert and transfer other video/audio files such as M2TS, MTS, AVI, MPEG, WMV, DAT, TS, MPV, NSV, MOV, QT, H261, H264, WMA, AAC, AIF, AIFF, AC3 and so on to iPod/iPhone directly. 4. Transfer any DVD movie to iPod/iPhone by first converting it to iPod format. 5. With this smart iPod manager software installed on your iPod, you can transfer iPod files between iPod and PC anywhere you go. 6. Take full advantage of your iPhone by managing it as a hard disk on Windows Explore. 7. All iPod/iPhone types including iPod nano, iPod mini, iPod shuffle, iPod classic, iPod touch, iPhone, iPhone 3G, iPhone 3GS, iPhone 4 are supported. 8. All information about your iPod/iPhone, such as iPod/iPhone picture, type, capacity, version number, serial number, and format can all be clearly shown on the main interface. Powerful, easily and fast convert DVD DIRECT to iPod Video and Audio. Qweas is providing links to AVCWare iPod Magic 3.3.0.1203 as a courtesy, and makes no representations regarding AVCWare iPod Magic or any other applications or any information related thereto. Any questions, complaints or claims regarding this application AVCWare iPod Magic 3.3.0.1203 must be directed to the appropriate software vendor. You may click the publisher link of AVCWare iPod Magic on the top of this page to get more details about the vendor.